BlindGossip – Lots of celebrity break up announcements this holiday season, but one more is supposed to be coming in the next few weeks. This couple has actually been split up for months now, but you may not have even noticed since – like Scarlett and Ryan – they are usually photographed separately from each other. They were going to announce a couple of weeks ago, but got cold feet once they saw the flurry of attention that other celebrities were getting for the same action. The more famous of the two wants the publicists to release the announcement between Christmas and New Year’s in the hopes that the public will be too busy celebrating the holidays to notice. Before you start feeling sorry for either of them, though, you should probably know that both have already moved on to new relationships. Didn’t see that one coming, did you? These two have been over for a while now, but the announcement and the paperwork kept getting delayed. There’s no pre-nup, and Ashlee has hired high-powered divorce attorney Lara Wasser. 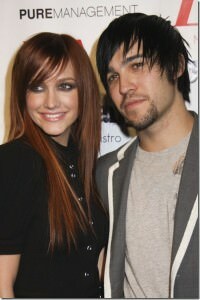 Pete Wentz is going to get his financial clock cleaned on this one.